While museums and organizations lock the industry's most important works behind glass to preserve their memory, development and publishing partners Upper One Games and E-Line Media are using video games to help preserve the legends of a people. In the upcoming "atmospheric puzzle platformer" Never Alone, players live out the legends and stories passed down for generations on the Alaskan Native community. Though the companies want their game to help educate the world about native culture while being entertained, Never Alone is also being positioned to help reignite passion and preserve the legends within the native communities throughout Alaska. Upper One Games was established by the for-profit enterprise of the Cook Inlet Tribal Council, a large non-profit organization that mainly serves the Native people within the largest urban area in Alaska. "We really focus on the advancement of people and their lives," CITC President and CEO Gloria O'Neill explains. "About six years ago we really started thinking deeply about what self determination looks like. 'What does it mean to truly be in charge of our own destinies?'" According to O'Neill, the video game industry made the most sense for the organization to explore, allowing gaming fans around the world to learn about the Native culture and, at the same time, reigniting interest in generations-old stories within the community's younger members. CITC then partnered with E-Line Media, a publisher of "game-based learning products and services" co-founded by Alan Gershenfeld, who was at the helm of a team that helped rebuild Activision out of bankruptcy in 1992. The first game of hopefully many in the partnership with Upper One Games, Gershenfeld says, is Never Alone, as part of E-Line's vision to create games that "share, celebrate and extend culture." With both companies sharing profit, money is expected to be funneled back into the non-profit organization for its causes, including education programs within its supported communities. "I've worked on big budget titles, and the idea to get back to the roots with a small team to work on something personal was really appealing," E-Line Creative Director Sean Vesce says. "Being able to get out of our cubes, which are typically a bunch of white guys talking about a fictional fantasy world, to be able to go into a community, learn more about a culture and then try to infuse their values and mythologies into a game that's fun and entertaining as well as thoughtful was something that seemed like an amazing challenge to us." Vesce brings experience to the team behind Never Alone, having previously been General Manager of Crystal Dynamics and serving as creative director at Activision on such titles as MechWarrior 2. "We put together a really great team; a small team, 12 folks in Seattle on the development side," including an Alaska Native writer. "In the Alaska Native community side we have storytellers, artists and language specialists that have a seat at the creative table, who have been along with us during the entire creative process helping to shape the game's design," Vesce adds. The two groups work in tandem, he says, and the Alaska Native community's involvement is not simply a "rubber stamp" approval of what the development team is working on. The results, while early, are striking. Powered by Unity, the levels of Never Alone feature snowy landscapes, powerful winds and ice floes. The grays and blues that make up the environment's colors are punctuated by a white haired fox and a young girl, Nuna, bundled in a large brown coat, as the pair attempt to progress through the landscape running from wild polar bears and traversing the shifting environment. As Nuna and Fox press forward, players may come across obstacles that require special abilities from either character. Fox is nimble and quick, Nuna can carry objects and utilize her bola to open pathways for the pair to use. Though the game can be played cooperatively by two players, single players can swap between the pair of characters to accomplish their tasks and solve environmental puzzles. 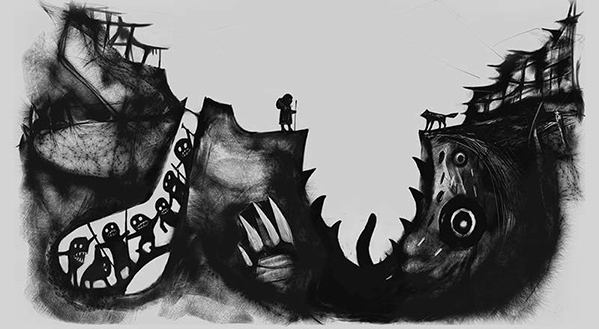 Never Alone will feature a variety of stories culled from legends of the Iñupiat people, focusing its primary narrative on the traditional story of an eternal blizzard that plagues the land. Nuna and Fox, rather than sitting back and succumbing to the elements, venture forward to discover the storm's source and restore balance. It's a simple but powerful tale that Gershenfeld says is infused with a culture rarely showcased to the public. "We really want to engage our community at all levels. We feel when Upper One Games are a success, it's the success of the community. The whole community shares it. Our main goal is to take our stories to the world and invite people in to who we are. We think that games is a great way of, not only sharing culture but keeping our culture alive," O'Neill, who also acts as President and CEO of Upper One Games, says. Never Alone is still in development at Upper One Games – "the first indigenous-owned video game developer and publisher in US history" – and is planned for release on PC and unspecified consoles.